Piqua, Ohio, Jan. 19, 2016 – For the third consecutive year, Hartzell Propeller will be the propeller technical partner of the Red Bull Air Race World Championship in 2016. Hartzell will provide its three-blade structural composite propeller known as “The Claw,” carbon fiber composite spinners, and lightweight governors to every Red Bull Air Race team. In addition, Hartzell will supply personnel for complete propeller technical support and maintenance services for all of the entrants in the races throughout the world. Hartzell Propeller Executive Vice President JJ Frigge said, “The Red Bull Air Race Championship races are great venues to clearly demonstrate the performance advantages and rugged reliability of Hartzell composite propellers in an exciting and fiercely competitive environment. 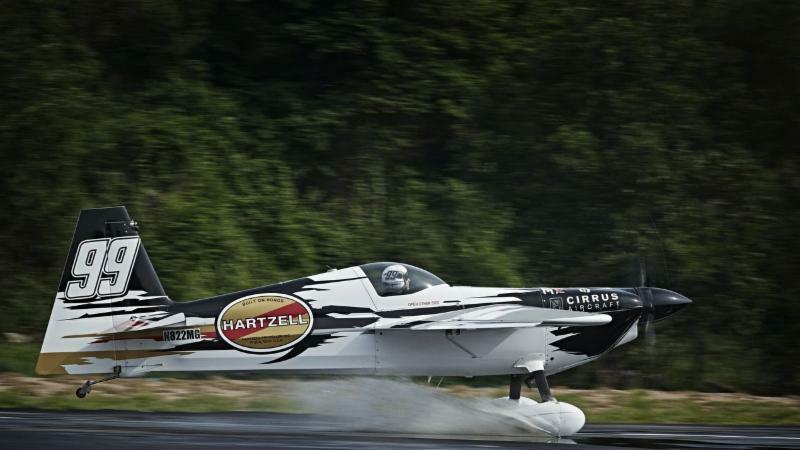 “It is no secret why Red Bull chose Hartzell for all of its propeller needs,” he added. The Claw race propeller produced by Hartzell embodies groundbreaking achievements and innovations that are at the very foundation of the spirited Red Bull Air Race World Championship. Hartzell’s three-bladed structural composite propeller was nicknamed “The Claw” by famed aerobatic performer Sean D. Tucker due to its high thrust and low gyroscopic forces and inertia. Again in 2016, Hartzell Propeller will be a co-sponsor for Michael Goulian’s entry into the Championship. Goulian is one of only six active Red Bull Air Race pilots to have won a race with his historic victory in Budapest in 2009. Goulian is one of the most exciting and determined pilots to fly in the Red Bull Air Race. The American has a crisp, aggressive and athletic style of flying that has made him a fan favorite around the world. Goulian is a fierce competitor who makes each high G flight maneuver a deliberate execution of precision aimed at shaving time from every run. The eight-race 2016 season will span seven countries over three continents. Two new locations are established high-speed motorsport venues. The series kicks off March 11-12 with the traditional season opener in Abu Dhabi, United Arab Emirates for the ninth straight time. Next up, is the Red Bull Ring in Spielberg, Austria on April 23-24. The series then makes a return to Japan, following the success of the debut race in 2015 that sold out. The championship then moves to Budapest, Hungary on July 16-17 where the racetrack’s pylons are set up in the heart of the city along the Danube. There, the pilots traditionally start the race by flying under the Chain Bridge. On Aug. 13-14, the setting is Ascot, Great Britain. The renowned horse-racing track has proven to be one of the all-time favorite stops in the history of the sport. The series then makes the highly anticipated return to the Lausitzring on Sept. 3-4. The final two races of the season will be in North America; first, on Oct. 1-2, with the Red Bull Air Race premiere at Indianapolis Motor Speedway. The Speedway will also be celebrating 100 years of aviation events, as the first race held there was also the first national balloon race, in 1909, the same year the world’s first air race took place in Reims, France. The season finale happens Oct. 15-16 in Las Vegas, where the 2016 World Champion will be crowned at the Las Vegas Motor Speedway. For more information on tickets or the latest information, visit www.redbullairrace.com.